STAY AT HOME MOM: I'm a Superior Scribbler! Toni at It is nap time gave me the Superior Scribbler award. Thanks Toni for this very nice award. I really appreciate it! 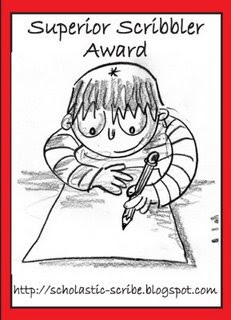 So the rules every Superior Scribbler will name 5 other Super Scribblers.If you are named you must link to the author & the name of the blog that gave you the award. Then you must display the adorable award and link to This Post, which explains The Award. Finally you must visit this post and tell your name to Mr. Linky List. Then they will have a record of all the people who are Super Scribblers! Come get your award everyone! Thanks so much Sue!!! Thank you for thinking of me as well. You are the best! Congrats to you! And thank you for thinking of me. I really do appreciate it!